HomeCinemaMasalaHrithik Roshan receives this Unique Gift from a fan! Hrithik Roshan receives this Unique Gift from a fan! Well, ever since his debut film Kaho Naa Pyaar Hai, Hrithik Roshan has won hearts and left many swooning over his Greek-God looks. With the fan following increasing with time, he found another set of fan following amongst kids with his superhero-like roles in Krrish. Now, the actor has been presented a memoir of a fan’s many encounters neatly compiled in a book, while on the sets of Super 30. Readers may be aware that Hrithik Roshan is shooting for Super 30 at the Northern region in India. 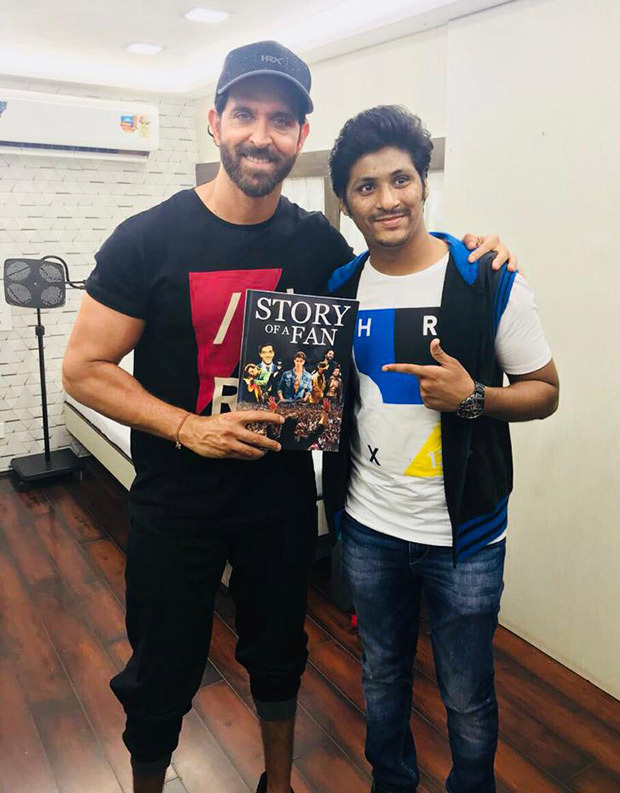 An ardent fan of the superstar named Pratik Chheda in a unique gesture got a book printed, compiling memories of Hrithik over 18 years of his career. His fan reached the sets of Super 30 in Mumbai to present the book to the Superstar. The actor on learning about the fan’s presence called upon to meet him. Not just that! The fan also had inked Hrithik Roshan’s name. “Presenting the memoir to Hrithik, he also showed him a tattoo of the superstar’s name inked on his arms. Hrithik was left stunned by his fan’s love,” added the source. As mentioned before, Hrithik Roshan is shooting for Super 30 where he will be seen in the unconventional role of a Mathematics professor. The film is a biopic of sorts based on the life of Patna based Math teacher, Anand Kumar. Super 30 will present Hrithik to the audience in a never seen before avatar as the actor will be seen playing a Bihari for the first time onscreen. In fact, this will be the first time Hrithik will be seen in a biopic. Kareena Kapoor Khan Justifies her statement on not being a Feminist, admits she is one!